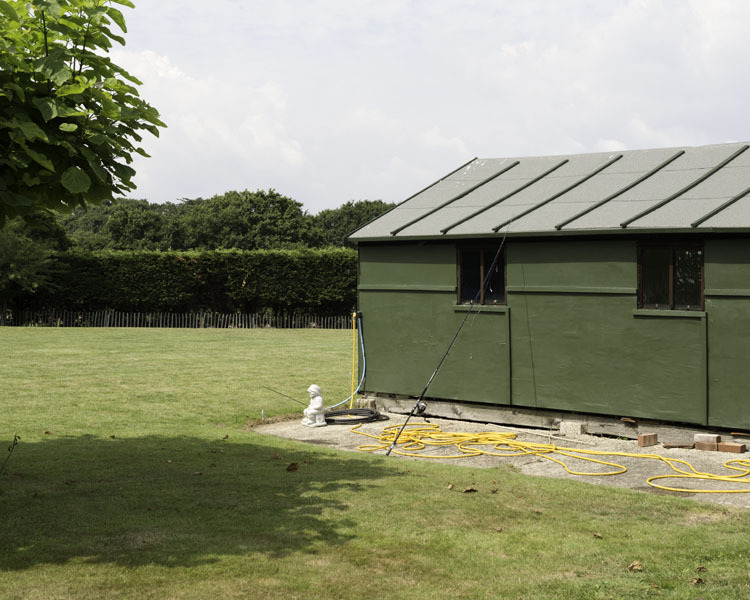 I have recently been making work for a new series near to Milton Keynes. Whilst walking around town, I found it interesting the way it seemed to be designed for the movement of cars rather than pedestrians. I was continually reminded, by the many signs around the city, that pedestrians do not have the right of way, which is reserved for vehicles. At times I found myself having to walk around car parks or along lengthy grid-like boulevards in order to find an underpass simply to cross the road. This makes it a frustrating place for a walker and I spent hours walking around without seeming to get anywhere. Milton Keynes was re-generated in recent years as a business and retail hub that was soon to become known as “the city of the future” (although it still only has the status of a town). The main source of activity is around a number of shopping malls in the centre. When I first visited “MK” in the 90s it seemed to be a town enjoying financial prosperity, as well as its status as the most modern city in the UK. When I recently visited it looked more weathered, many of the shops had closed down, the nightclubs and bars looked tired, and the many car parks were almost empty. 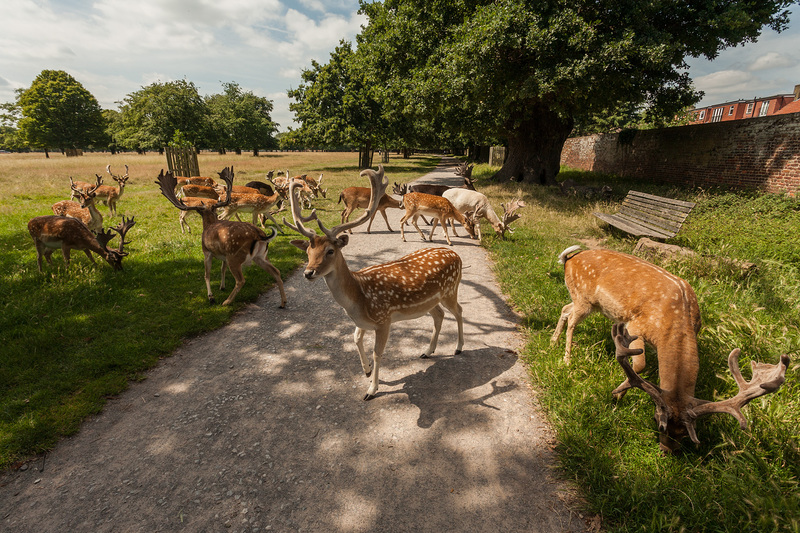 Milton Keynes is located in Buckinghamshire, which is famous for its lush vegetation, green pastoral landscapes and abundance of trees. When I came across a man on his phone, next to an artificial tree, it seemed to reveal something insightful about the place. 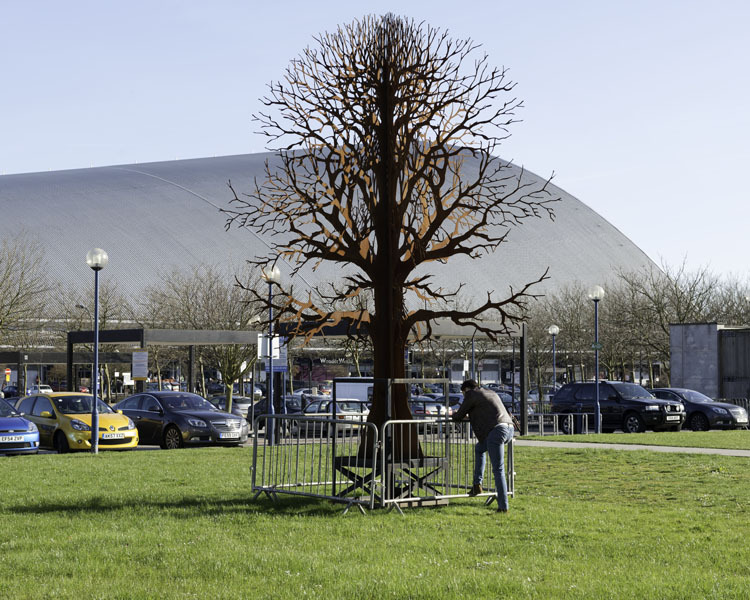 For me the scene represented the sense of artificiality I felt in Milton Keynes, which was compounded by the snow dome that can be seen in the background of the photograph. 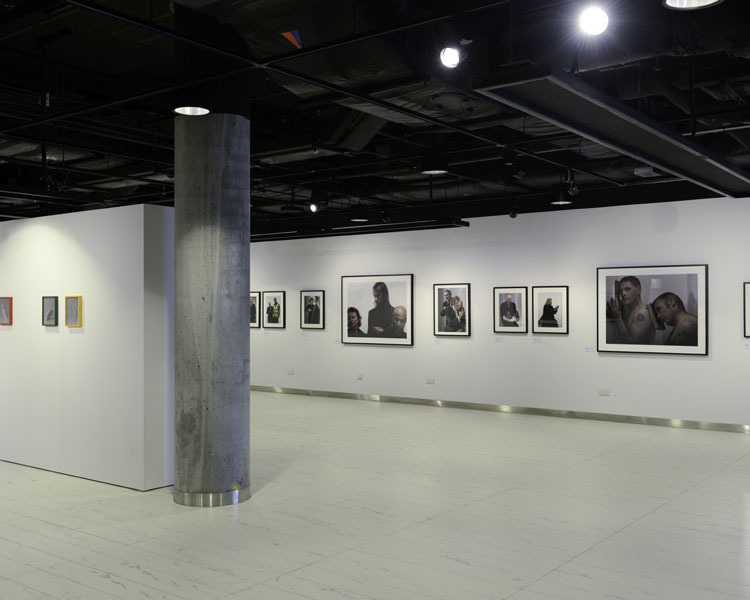 Ordinarily I use this space to talk about photography and walking, but today I thought I would mention something slightly different, my visit to the new Library of Birmingham. I was incredibly excited to return back to my home city as there has been quite a buzz surrounding the opening of the library. The project has been in operation for a number of years and the local media has been following the progress of the building closely. The old central library, built in 1974, played a tremendously important part in my adolescence, as I spent many an afternoon looking through the library’s collection of photography books. 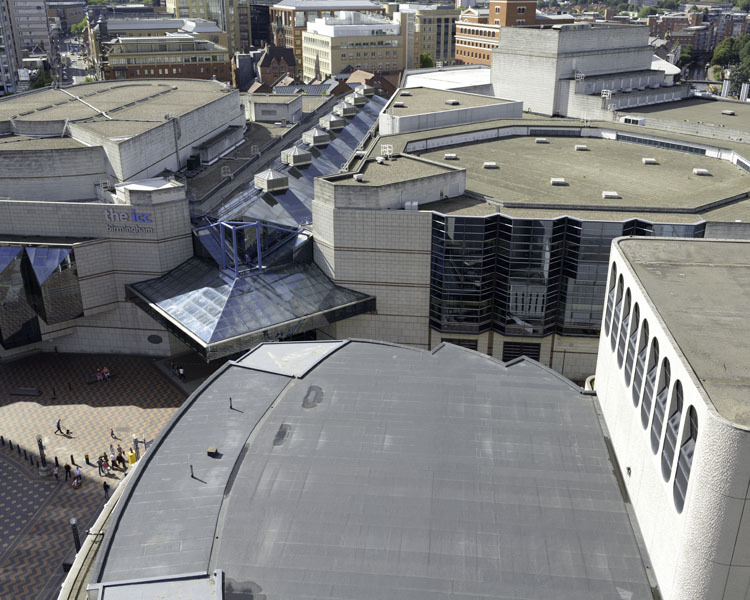 For some time the older building has looked tired, fitting in with a particular style reminiscent of the 60’s post war architecture that has become synonymous with the of centre of Birmingham. In comparison the new library is much more opulent and impressive, marking an encouraging sense of direction for the redefining and modernisation of the city. The library appears to be much larger than its predecessor reaching upward for nine storeys. 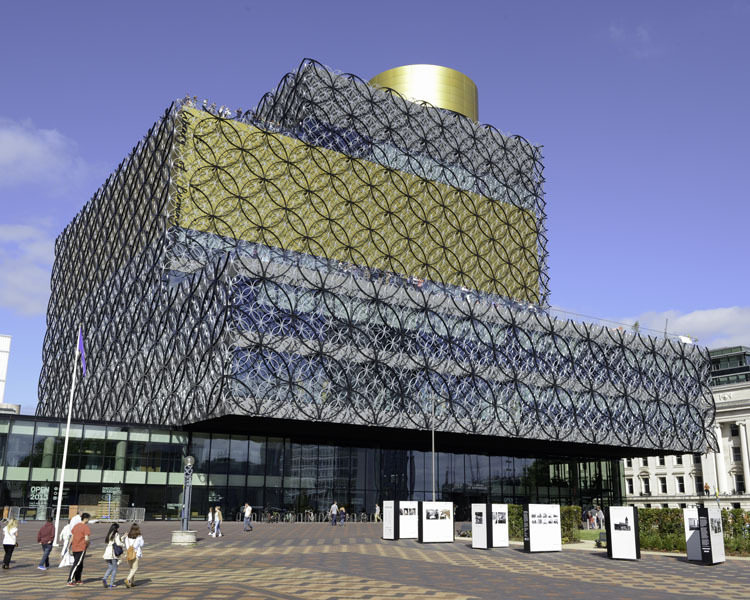 For me the new library is perhaps Birmingham’s most spectacular architectural achievement in recent years. With more than three million visitors expected each year, one of the most exciting aspects of the library opening is the thought that it will be driving more people towards an educational space rather than a retail environment. Recently Birmingham has had an number of interesting and exciting redevelopments, the Bullring, the Cube and Selfridges spring to mind, but for me this marks a much more cultural venture, promoting Art and Education rather than the possibility of the ultimate retail experience. Each of the floors are strikingly decorated with blue neon and black. 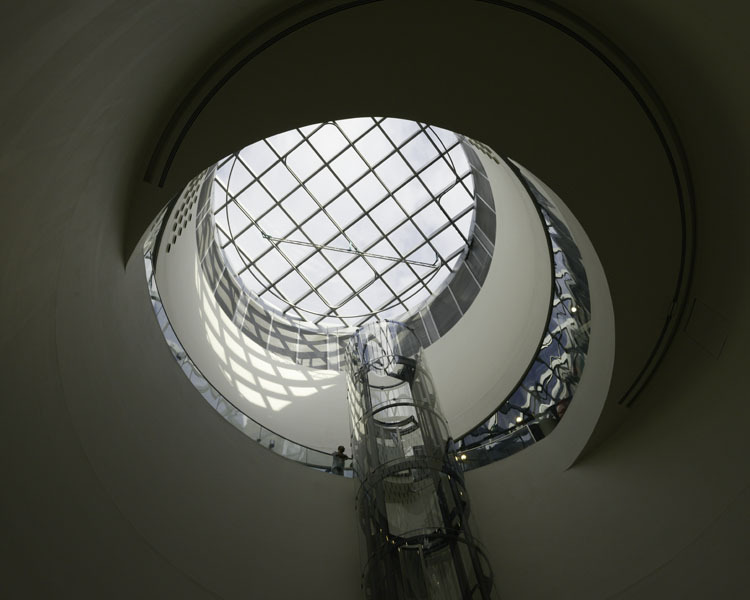 Escalators swiftly move visitors between floors and a glass lift transports visitors up to the top terraces. Looking upwards towards the roof brought the MoMA in New york to mind. What really blew me away about the building was the access to the two elevated garden terraces. When looking over the railing it dawned upon me that in all my years growing up in Birmingham I had never seen it from above, and here the views are extraordinary. 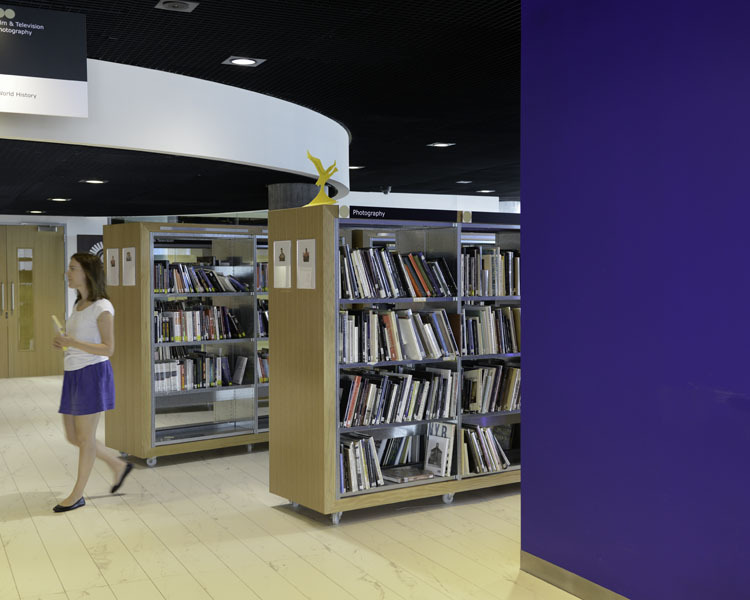 The Library has various cafes and interactive media libraries as well as its impressive photographic collection. The old central library used to house its photographic book collection within glass cases, which made it frustratingly inconvenient to access the books. However they seem to have made steps to resolve this, as many of their photographic books are now on display. 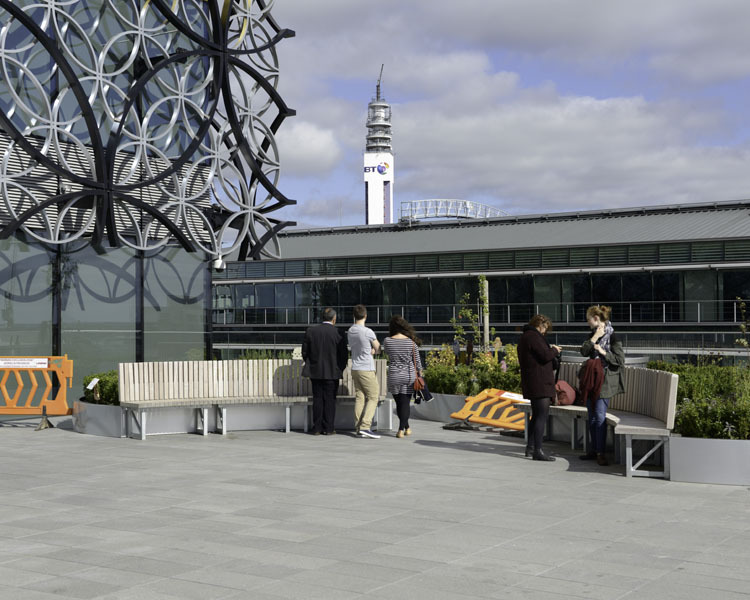 The Library of Birmingham also features a BFI Mediatheque, which provides free access to the National Film Archive. As well as exploring the building, I also wanted to visit the reference works exhibition at the library’s new photographic gallery. For photographers based in the Midlands, this is a very exciting hub for exhibitions, commissions and artist talks. The gallery is a nice large space and the current exhibition was well curated and presented. 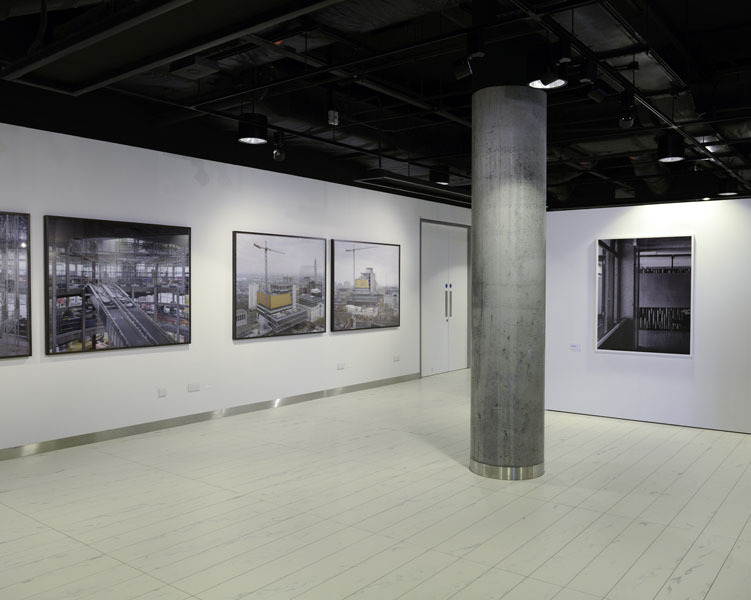 Four photographers, Brian Griffin, Stuart Whipps, Andrew Lacon and Michael Collins, were commissioned to make a body of work in reference to the building. All of the work was beautifully printed and framed and each piece was given ample space for the work to take hold of the viewer. It’s a triumphant first show from an inspiring and highly influential selection of photographers. For more on the exhibition, you can visit a dedicated site here. Looking back on my visit to the library, I left feeling excited. 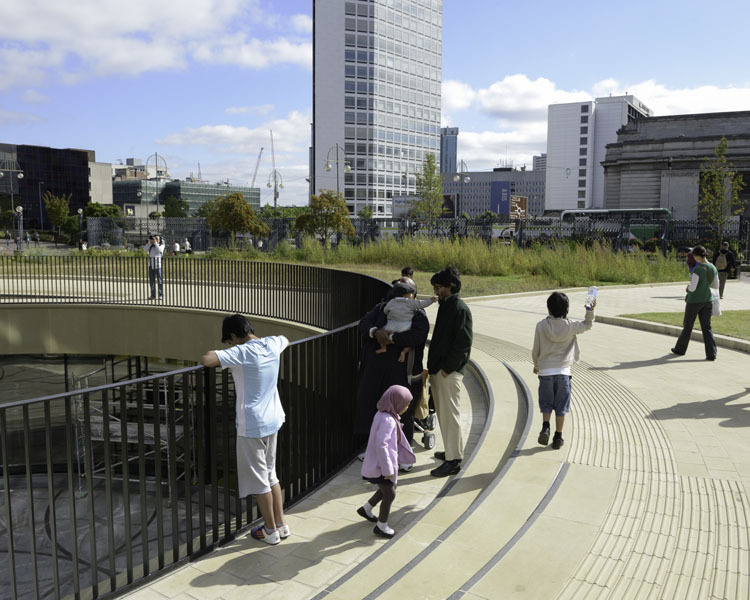 Birmingham, being an important post industrial city, has gone through a massive transformation in recent years. It has become a busy retail environment that for me, at times, has lacked the cultural buzz you can find in other major British cities. However I think times are rapidly changing and Birmingham is fast becoming the place to visit in the Midlands, which is much richer in photography and the arts. The new library is symbolic of this rapid change and will help to make the city a distinctive and thriving place of cultural modernity. I was impressed and I highly recommend a visit. 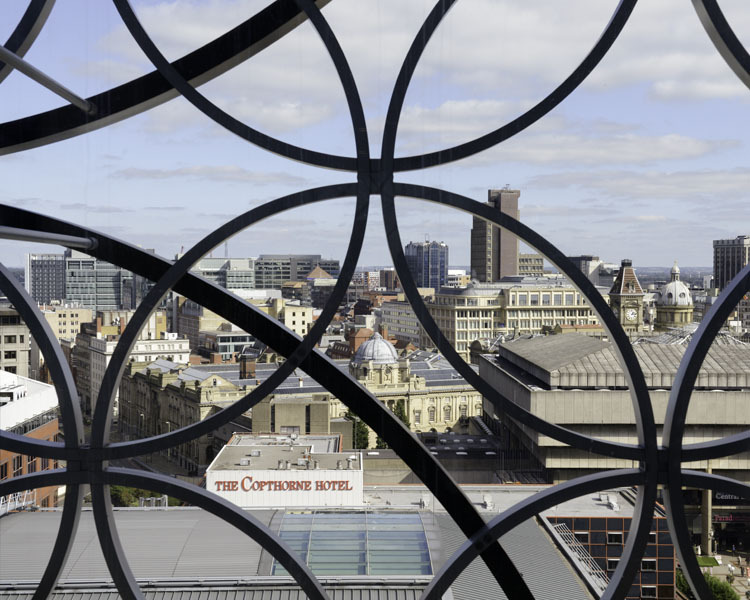 You can find out more information about The Library of Birmingham here. I made this photograph recently when I was out walking in Amberley. 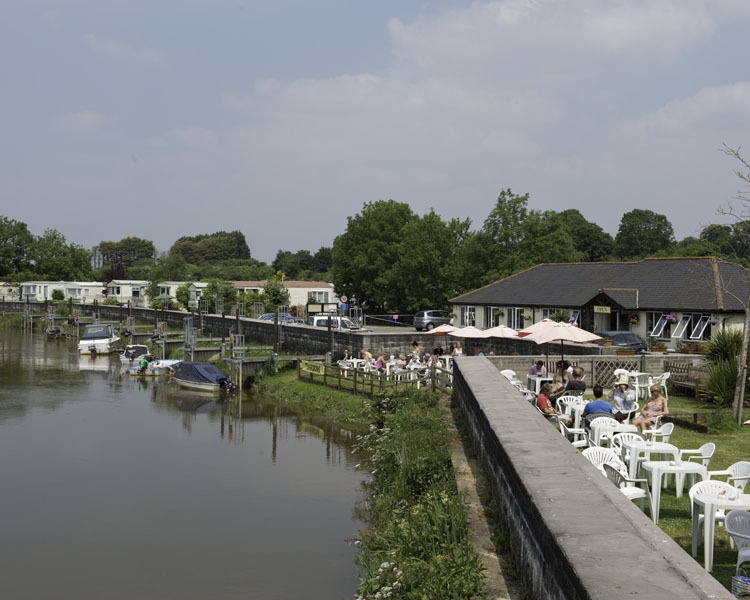 The river is the Arun and at 37 miles (60 km) it is the longest in Sussex. This was once the site of a busy inland shipping route, built to connect London with the English Channel and beyond. However traffic on the route declined due to the railways and it ceased to operate commercially in the 1880’s. As I stood taking in the view, I thought back to the successes and failures surrounding the landscape. Once a busy scene where one could see vessels transporting goods has now given way to being a place of leisure, peace and tranquility. The river bend is now a place of calm where I watched patrons of a tea room eating tea cakes and chatting amongst one another. I thought to myself what could be more illogical, yet typically English, than sipping hot tea in the blazing sun. What a bizarre bunch we are. 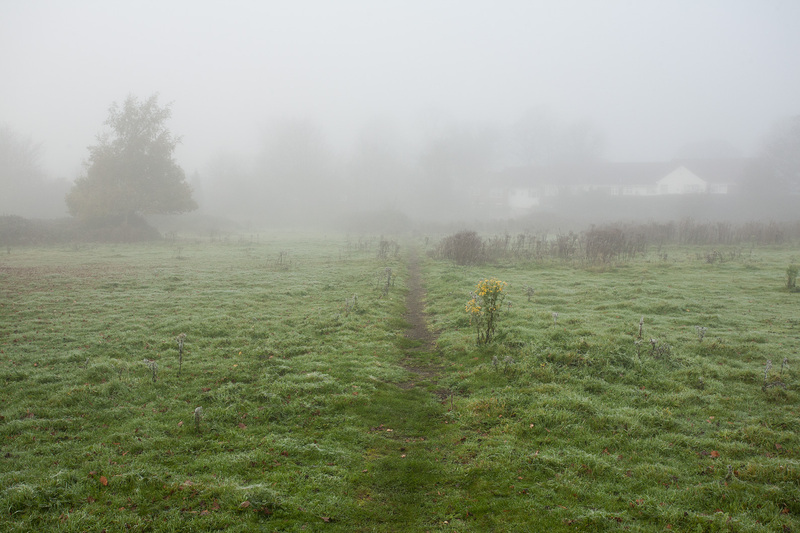 I recently came across Tudor Prisăcariu’s project LONDON LOOP, where he circumnavigates London on foot along its 240km orbital path. You can see a dedicated website for LONDON LOOP here or visit Tudor Prisăcariu’s website here. Recently I came across the work of Dennis Adams and Laurent Malone, two artists that investigated walking from a truly unique perspective. 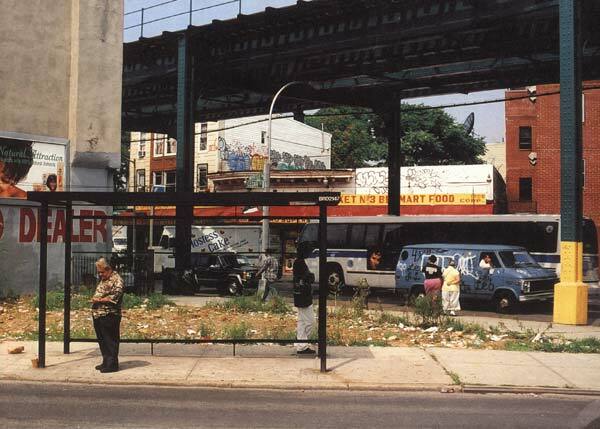 Starting at 8:00 am on August 5, 1997, they walked non-stop from downtown Manhattan, across the Williamsburg Bridge, to JFK Airport. For 11 hours and 30 minutes, they followed the straightest path possible toward their destination, crossing neighbourhoods, backyards, expressways and cemeteries. As they walked, they studied their surroundings, capturing changes in the landscape as they passed through it. They shot photographs along their route using a 35 mm camera that was shared between them. Prior to the start of the walk they had came to the understanding that either of them could take a photograph of their own choosing, at any time during the walk. When this occurred, the person who shot the photograph handed the camera to the other person, who then shot a second photograph in the exact opposite direction. For the second photograph, no attention was given to the subject, composition or technical adjustments. From the beginning to the end of their walk, they produced 486 photographs. 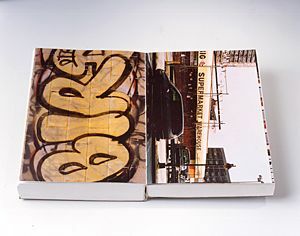 The work culminated in a book called JFK (now unfortunately out of print) that contains 243 sets of paired photographs in chronological order. The left-hand pages represent the selected shots that were composed and the right-hand pages represent the corresponding shots created by chance. What is interesting about the walk is that they cleverly chose a simple route, a direct path through the city. This de-complicated the navigational aspects of the walk so they could concentrate more on the task at hand. 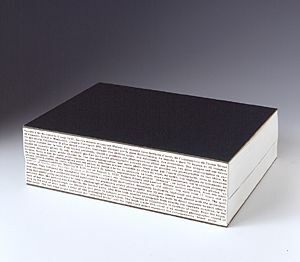 The work is given a narrative structure, as the walk has both a beginning and an end; once the destination of JFK was reached, the work came to an end. The structured walk created limitations within which they could work, in order to create a more specific photographic response to the locations they walked through. JFK is ultimately a photographic record of their walk, but for me what makes it highly original is the way that each location was captured as a pair of photographs, made in almost the same time. This enables us to see each location from two different perspectives. The curious thing is that we never know which of the two artists shot each of the photographs. 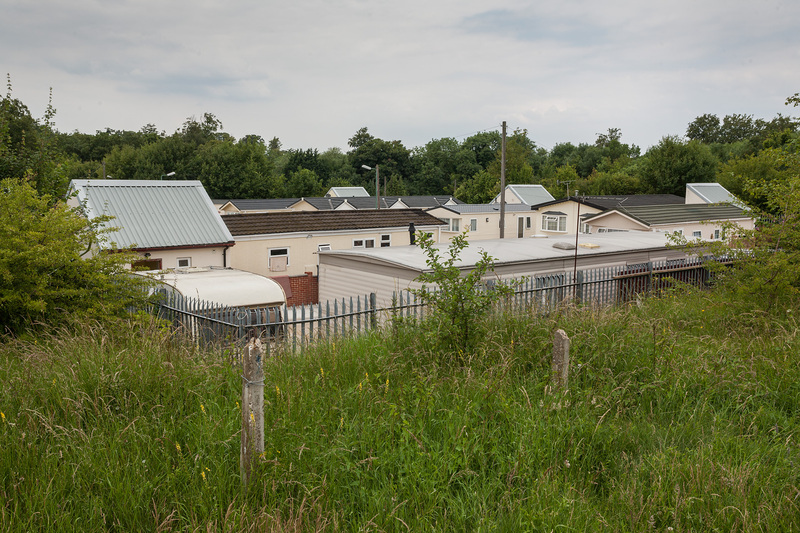 I have been out and about again recently, making work for my series Perambulation. Although this photograph doesn’t really fit in with the series I couldn’t help myself from making it. As I walked through an alleyway I peaked over a fence into an adjoining garden. Something about the scene made me think about my own predicament. Like the gnome I was also fishing alone in the countryside, but for me it was not fish I was looking for but for photographs, not knowing where the next one would surface. 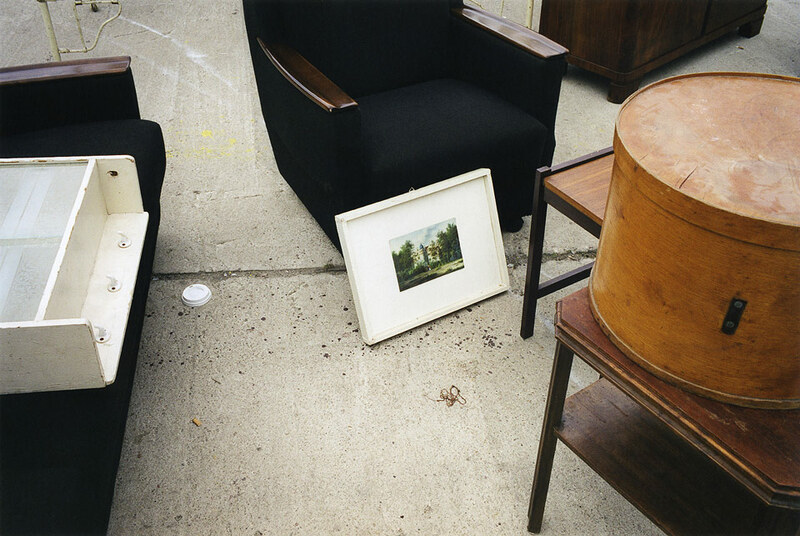 As part of Urban Photo Fest you can partake in a series of walks. Each of the four walks takes place in London during October.